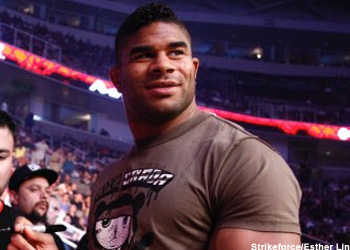 Something appears to have been lost in translation between Dream and Strikeforce heavyweight champ Alistair Overeem. The Dutchman claims that he WON’T be facing Ricco Rodriguez in the Orient this weekend, despite the murmurs coming from the Japanese promotion. “I feel sorry for Rodriguez’s camp if they still think the fight is on, and I apologize to my fans who have bought a ticket to see me compete,” Overeem told MMAJunkie.com late Monday night. The same website reported last week that bout agreements were expected to be submitted shortly, with an official announcement coming within the following days. Not true, states the controversial Ubereem. After slapping Brett Rogers silly at “Strikeforce: Heavy Artillery,” Overeem said he wanted to step away from the cage for a minute. “After my Rogers fight, I decided to take time off and do media appearances – (the) MMA expo in Canada, E3 Expo (and) Strikeforce events – and enjoy some time off with my family,” Overeem stated. “I knew Dream wanted me on the show, but I didn’t want to go back [into] training preparation. Then, they offered me a fight against Andrei Arlovski for the Dream heavyweight title. Unfortunately for the champion, the injury bug forced Arlovski off the July 10th card. “During my training I found out that Arlovski was not going to be my opponent, and [Dream] changed opponents numerous times,” Overeem added. “I’ve heard names like Tim Sylvia and [Ikuhisa Minowa] come about. At one point, I received notice that they had found an opponent, but the Dream heavyweight title was not on the line anymore. Rodriguez’s manager, super agent Ken Pavia, claims to have a signed contract in hand. Dream representatives followed that up by stating late last week they expected the bout to go forward. Although, they were reluctant to make an official announcement. The show takes place inside the Saitama Super Arena in Japan and will air live on HDNet in North America. A lightweight title scrap between champ Shinya Aoki and Tatsuya Kawajiri will headline the event … unless you’ve heard otherwise.